If you follow me on Newgrounds and social media, you might have seen that Brackenwood is making a return this year. After the cancellation of the Dashkin game and me being promoted at work, Bitey seemed to have no future. In years past, he was so real in my head that I could even have stupid conversations with him. But early last year while looking at some old sketches, I realised that I didn’t really know him anymore. At one depressing point I even contemplated making a very short farewell movie, complete with a very final ending. With the teaser illustrations over the past few months, I was gauging reaction and making up my mind whether or not to pick up from where The Last of the Dashkin left off. The general reaction to the illustrations was better than I expected and great motivation for me, so on Friday March 18 I launched the Patreon campaign. Its immediate success showed me just how many people miss Bitey and are willing to support new Brackenwood works. While “The Last of the Dashkin 2” is the current active project, it will take time. But I’ll be releasing new stuff in the meantime. They’ll be short Brackenwood stories that may or may not tie into the greater story of the world. 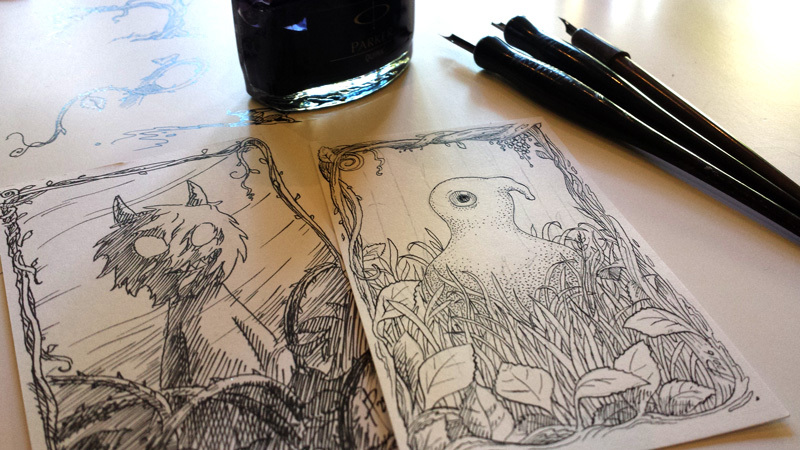 To reward them for their support, most work-in-progress stuff will only be available to my patrons (along with their other rewards, like posters and collector cards). Actual Brackenwood shorts will be released on Newgrounds first, then here on my website. Thanks for sticking with me, whether it’s here, or on Patreon, Newgrounds, Twitter, Facebook, YouTube, the BCA FX course or you’re just spreading the word about my work, your support means more than I can type. To anyone just popping in to see if there’s anything new at BiteyCastle this year, HEY WELCOME BACK! YOU’LL NEVER GUESS WHAT’S HAPPENING!! This cured my winter depression and restored my faith in the future of all things. Thank you Adam. Thanks Luis! They’re always growing. It’s getting pretty crowded in there! I’m so happy to hear you are getting back to Brackenwood stories! I’ll always remember the video of Littlefoot, I think I’ve watched it 20x hahaha. I liked the other video’s alot too, but this one was my favorite when i was younger! Anyway, I saw u sold the hand made posters for members paying 60 euro a month, but I’d like to buy one for a one time payment of 60 euro.. Is this possible? Ofcourse I’ll pay for the delivery costs! You can guess with what character I’d like to have the poster: LITTLEFOOT! Maybe Bigfoot on it too in the background, I’ve always like the big landscapes with littlefoot watching them(and running away later for bitey).. Anyway, sorry for the long post I’m just a big fan of your work! I admire your work from far away and never have enough of it. I love Bitey and all Brackenwood creatures. And those subtle notes of yuyu in trailer make me to watch all Brackenwood stories once again. I wish you as much time and confidence as needed to show us next amazing part. I’m excited to see what this new character will bring to the table. Been looking forward to this for years. It’s been awhile since I have came to visit this site. I am overjoyed to see you are finally picking Bitey back up and sending him through Brackenwood once again. lol. The reason why I came to the site today is because “Snapchat” has a new filter which instantly reminded me of Bitey. ( Black eyes and Goat Horns). Glad I got distracted by a social media app for once. Keep being you man. Never forget the satisfying feeling of accomplishing a project. When you look back on all you have done isn’t gratifying to know that YOU made it happen? Again, I am super thrilled that you always kept Bitey in your heart. I always have and always will. You should honestly do a kick-starter. I bet you’d get a lot of backers! I agree, Kick-starter would probably serve him very well. Oh man, I’m so excited to see Bitey back in action! I’ve been watching these since they came out. I am ashamed at just finding out about this now, but I pledged immediately on Patreon. Brackenwood changed my life. I truly hope Patreon does good for you. This fills me with joy! Can’t wait to see what you have in store for us.